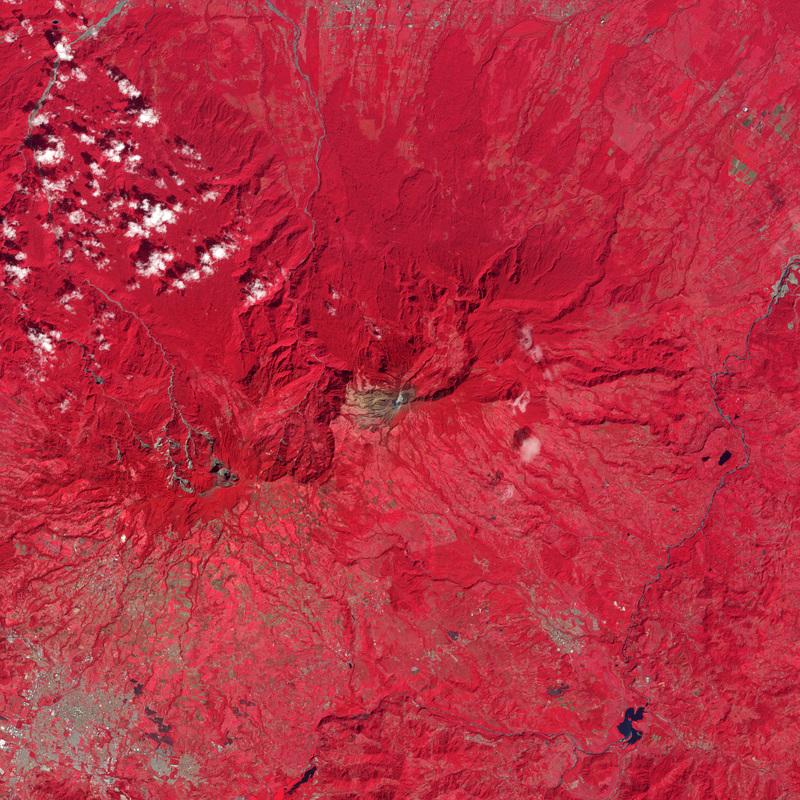 Turrialba is the eastern-most of Costa Rica’s active volcanoes. 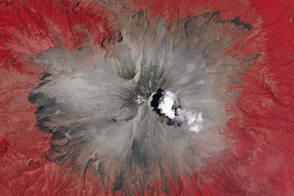 A series of small explosive eruptions began there in January 2010, the first substantial activity at Turrialba since the 1860s. The 2010 explosions were presaged by the opening of small gas vents (fumaroles) beginning in 2006. 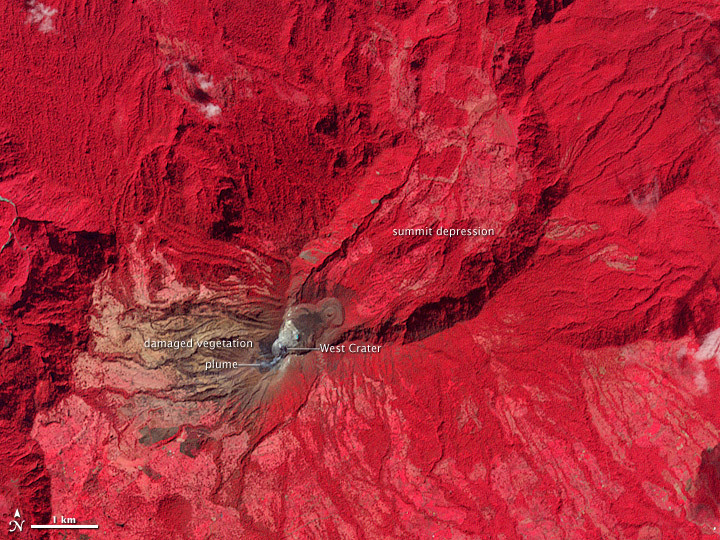 A new vent, located on the southeastern flank of the volcano’s West Crater, opened on January 12, 2012. According to the Observatorio Vulcanológico y Sismológico de Costa Rica, the new vent exhibited “a vigorous output of bluish gas at high temperature (T > 592°C) that generated a jet-like sound audible from the visitor lookout.” Activity since 2010 had been confined to a larger vent on the southwest flank of the West Crater, which continues to be the major source of emissions. This image was acquired on January 21, 2012, by the Advanced Spaceborne Thermal Reflection and Emission Radiometer (ASTER) aboard NASA’s Terra satellite. 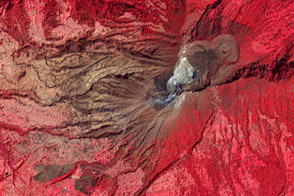 The false-color image is a combination of near infrared, red, and green light. Healthy vegetation is bright red, while vegetation damaged by years of acidic gas emissions is brown. Bare ground in the summit craters is brown or gray. The rock is very weak at the summit of Turrialba due to the intense rains of the region and the persistent hydrothermal activity at the summit. This means that new vents can open at the summit when pressure in the conduit is high enough to make its way through the weakened rock. The activity of January 12 was a pressure release at the summit through the hydrothermally-altered “rotten rock,” not a magmatic or phreatic (steam-driven) eruption. NASA Earth Observatory Image by Jesse Allen and Robert Simmon, using data from the NASA/GSFC/METI/ERSDAC/JAROS, and U.S./Japan ASTER Science Team. Caption by Erik Klemetti (Denison University & the Eruptions blog) and Robert Simmon. A new vent opened at the summit of Costa Rica’s Turrialba Volcano in mid-January, 2012. Strong, long-lasting volcanic tremors and emissions of gas and ash in early January 2010 marked an increase in activity at Costa Ricaâ€™s Turrialba volcano. Activity continued through January 2012. Global Volcanism Program. (2012, January 18). Turrialba. Accessed January 25, 2012. Klemetti, Erik. (2012, January 5). Turrialba in Costa Rica erupts and a close view at Poas. Observatorio Vulcanológico y Sismológico de Costa Rica. (2012, January 18). Turrialba Volcano (Costa Rica): Opening of a new fumarolic vent on the southeast flank of the West Crater on January 12th, 2012. Accessed January 25, 2012.